I poured my homemade strawberry-mint base into my new ice cream maker. I hit start and nothing happened. I immediately turned it off, thinking that I blew a fuse or something. This wouldn’t be the first time for me. Adjusting to the different electrical voltage/appliances in a foreign country has been what you could call….challenging. My husband told me I just had to attach one adapter to the plug and it should work. Well, it didn’t. Then, I thought I had killed my brand new machine that I recently had brought back from London because I couldn’t find one anywhere in Istanbul. “Why would I do that? I know how to operate an ice cream machine. And you’re supposed to know this electrical stuff,” I told him. Well, I plugged the machine into a UK/Turkish adapter, which I plugged into a Turkish/U.S. adapter that I plugged into our 110 to 240v electrical transformer brought from the states. Then, I had a new obstacle to overcome. During these 10 minutes, my ice cream base had started freezing to the sides of the bowl in the machine. The paddle was stuck and wouldn’t spin. Now, I had to scrape out most of the ice cream and carefully melt it in the microwave. I poured the reheated base back into the machine, turned it on and it finally started spinning. This is what a woman will do to make homemade ice cream! In our marriage vows, I promised to make my hubby homemade ice cream at least once a year since it’s his favorite dessert in the whole world. However, at the time I didn’t realize I’d be dealing with these issues. Just kidding, honey! Anyway, the bright red çilek from the pazar were simply delicious. When I asked the satıcı if I could take a photo, he proudly showed me a photo of the pile of çilek he had take with his own camera. These çilek were from the Antalya region of Turkey. After my machine had been chugging away noisily for about 30 minutes, I’m happy to report that my ice cream turned out beautifully. The consistency is bit more like soft serve when it first comes out of the machine but will harden after 2 hours or so once placed back in the freezer. Since I had some leftover mint leaves from making the pea soup, I added it in with my cream and milk while I was making the ice cream base. Homemade ice cream really is worth the effort. I just hope you don’t have all the trials and tribulations that I dealt with in my kitchen! Hopefully, my next batch will be easier. 1. 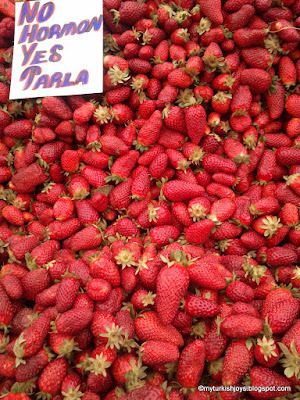 Place strawberries, sugar and lemon juice in a bowl together and mix well. Cover the bowl with plastic wrap and let macerate at room temperature for 1 hour. 2. Then, place the strawberries in blender or food processor and puree until smooth. Set aside. 3. In a medium-sized pot, bring the milk and cream to a boil. Add the mint leaves. 4. Remove the pot off the heat and cover with a lid. Let steep for at least 15 minutes. 5. In a separate bowl, whisk together the second amount of sugar with the egg yolks. Then slowly pour some of the warm cream mixture into the yolks, whisking constantly, then scrape the warmed yolks back into the saucepan. This is the tempering stage of making a custard...i.e. ice cream in this case. 6. Cook the custard, stirring constantly with a heatproof rubber spatula, until the mixture thickens and coats the spatula. This stage is known as nappe in French cooking. If using an instant read thermometer, it should read around 170ºF (77ºC). I always do this stage by eyeballing it. If I can run my finger through the custard on the back of the spoon and the lines don’t run together, then the custard is done. 7. At this point, add the strawberry puree into the hot mixture. I used my hand immersion blender for a few minutes to puree the mint and the strawberries a little more thoroughly. 8. Then, strain the mixture through a fine-mesh strainer. Place the mixture over an ice bath until cool. 9. Refrigerate the mixture thoroughly, preferably overnight, then freeze it in your ice cream maker according to the manufacturer’s instructions. 10. When your ice cream base is almost done spinning, add the vodka while the machine is churning. Note: by adding alcohol, you can prevent the ice cream from freezing rock solid later in your home freezer. This is what your ice cream should look like when it's almost done. Stuffed - Turkish Kabak Dolmasi!